This product was added to our catalog on Sunday 28 February, 2016. Earthly pleasures abound in this adorable gardening tote filled with the tools of the trade, and delicious snacks to boot. When Mom is ready to take a break from composting, planting or harvesting your garden, treat her to some delicious delights. 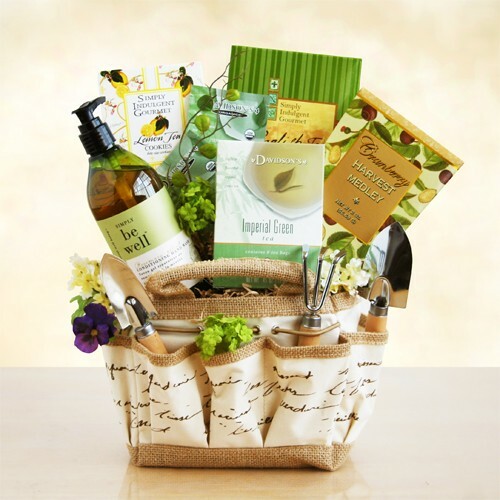 This gift includes English Tea cookies, Lemon tea cookies, Cranberry Harvest dried fruit, and soothing green tea. Also includes an assortment of seeds to plant in her garden. * Please note that on occasion, some items maybe substituted with other items of equal or greater value.